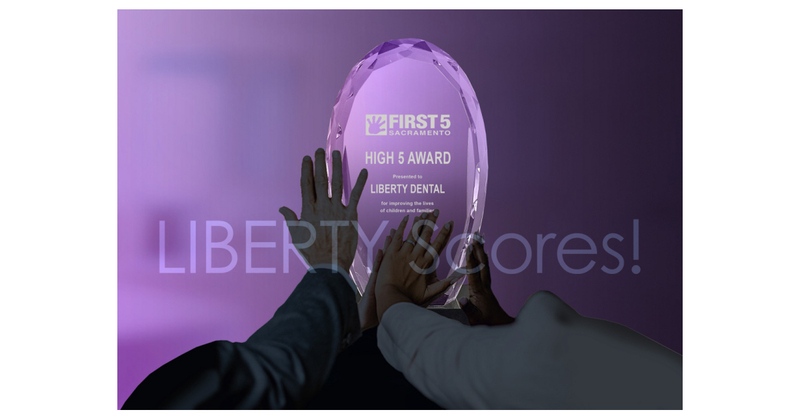 SACRAMENTO, Calif.–(BUSINESS WIRE)–LIBERTY Dental Plan is honored to announce that on January 8, 2019, we received the “High 5 Award” from the Sacramento, California First 5 Commission at the “Raise Up Sacramento” ceremony held at the Golden One Center. The award was given in recognition of the work LIBERTY is doing in Sacramento County, along with Health Net and Access Dental, for improving the lives of children and families through sustainable funding for children’s dental services, including the “Early Smiles” Sacramento school-based screening program. As of this date, “Early Smiles” dental hygienists have performed over 20,000 screenings, preventative fluoride varnish application & navigation to the three dental plans for follow up assistance. Because of the partnership between LIBERTY Dental Plan, Access Dental & Health Net, First 5 Sacramento & the Center for Oral Health, the “Early Smiles” Sacramento program was able to step in as of June 2018 to take over the dental screening program in the 110 SETA Head Start pre-school locations, that otherwise would not have continued due to lack of funding at the County level. “We are honored to receive this award from First 5 Sacramento, one of the most outstanding and effective community leading advocates for young kids in the entire Country. We have worked hard to help improve the oral health of Sacramento’s children and we pledge to continue to work and improve the smile of every young person we can reach,” said John Carvelli, Executive Vice President of LIBERTY Dental Plan. LIBERTY Dental Plan® (“LIBERTY”) is a national full-service dental benefits administrator providing services to over four million recipients in public and commercial programs in fifty states, including over two million Medicaid participants. LIBERTY, founded in 2001 by Amir Neshat, DDS, is privately held and boasts an executive team with over two hundred years of dental, health, and managed care industry experience, combined. LIBERTY, through its passion for oral healthcare, is committed to improving the overall well-being of the communities it serves.